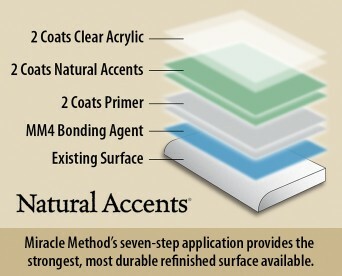 Natural Accents® is a revolutionary new finish for countertops, vanities and ceramic tile. Natural Accents has a multicolor appearance and texture of stone, but it is only a fraction of the cost of real granite, imitation granite or man made materials like Silestone®, Corian® or Swanstone. The look of stone at a fraction of the price! 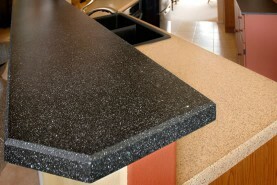 Laminate countertops updated with the stone finish look! Applying Natural Accents involves cleaning the original surface, repairing any knife cuts, burns, etc., and applying Miracle Method’s MM-4 bonding agent. MM-4 is a proprietary, non-acid bonding agent that assures thenew surface will stick. The surface then receives several coats of Natural Accents color until the desired appearance is achieved. Once the color coat is cured, two coats of clear protective coating are applied. The entire process takes 48 to 72 hours, not weeks, and certainly without the mess of traditional removal and replacement. The Natural Accents stone look is not only becoming the hottest new look for countertops, but it can also be applied to tile bathtub surrounds and bathroom tile floors. Plain tile is giving way to the beautiful multi-color hues Natural Accents creates in contrast to a glossy white bathtub or solid color tile floors. 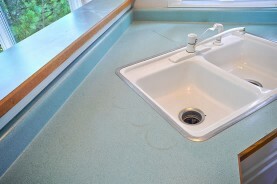 Is a Natural Accents refinished surface durable? There are no shortcuts to being strong. 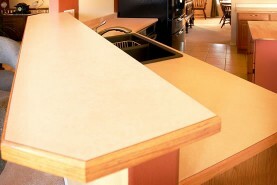 Our unique seven-step spray application gives you the most durable refinished countertop surface possible delivering a finish that is as long lasting as it is beautiful. 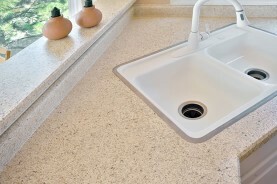 Natural Accents countertops are seamless, non-porous, heat resistant and scratch resistant. In the unlikely event that the surface finish is damaged; it can easily be repaired. Natural Accents – How do I find a Miracle Method Office? If you would like to see samples of how Miracle Method’s Natural Accents can give your kitchen or bathroom an exciting makeover, click Find a Location or call our toll free locator number, 1-888-271-7690, to reach the nearest Miracle Method professional.